The mornings have been very frosty lately, so it is appropriate that the color way of this Cascade Heritage Prints yarn is "Frosty Morn" (#05) This is pair #4 for the Box of Socks. The remaining yarn was used to knit the two baby hats. The hat at the bottom was knit with a semi-solid purple, using the helical stripe technique. I love how alternating the colors changes the appearance of the hat. The technique creates a smooth surface without having to carry the yarn on the wrong side. If you've never tried the helical stripe technique, I recommend it. I love how the yarns blend and create a design. 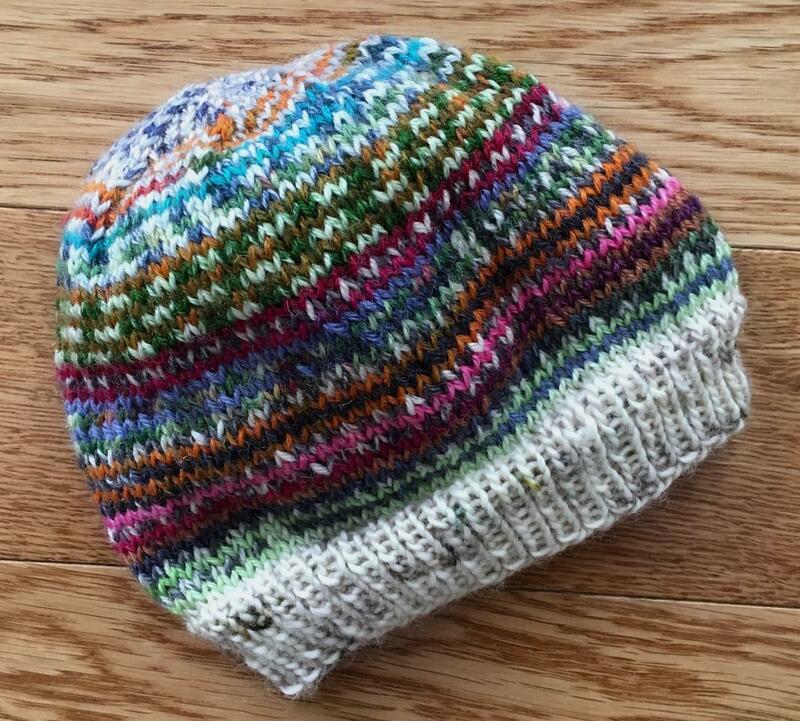 This multi-colored hat was knit with over six small balls of scrap sock yarn, so I did have ends to weave as I knit. More information can be found on Mason-Dixon Knitting's website. Nice use of all the yarn-I love the effects you've achieved with the Helix method of striping!!!! Very nice... and I'm sure there will be lots of baby's warmer for your efforts. So pretty! I think there are some very pretty colorways in the Cascade Heritage Prints. I have several skeins in my stash - I need to get moving!! And, I've wanted to try the helical stripe technique...hoping it's easy to learn. All are so pretty and who would think scraps could end up a masterpiece. I have never seen that striping pattern before but I am sure going to look it up now! Gorgeous colors! 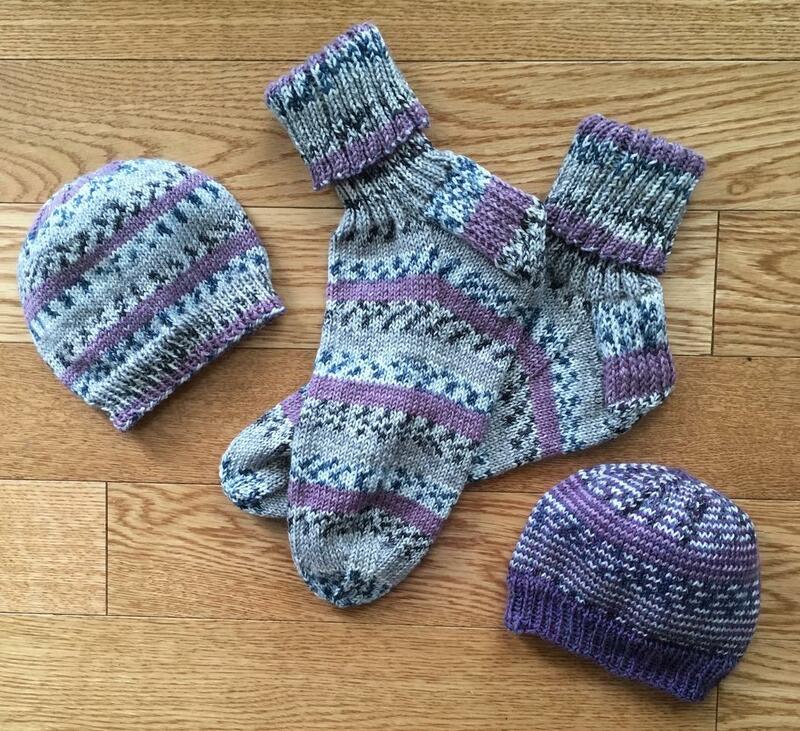 Those baby hats are just wonderful and such a great use of scrap yarns. The past few days were frosty here too, but today we have a winter storm again. Snow and blowing. Fair Isle without all the WORK of Fair Isle. They are all beautiful. It has been chilly and snowy/rainy here too. We had a hellacious snow storm yesterday morning and by 4 o'clock it had all melted. Nice hats! Thanks for introducing me to helical stripes; they are fun to do that way. Oh, and do you think Mother Nature hasn't gotten the spring memo yet? Those are beautiful hats. Thanks for the video. I’ll definitely be watching it. Socks and hats are wonderful. So were the socks knit from striping yarn or did you have a ball or two of the plain purple to work with the Frosty Morn yarn? All are really nice. They say we're to get some snow this week. REALLY folks it is APRIL -- spring is trying so hard to come. So quit with the snow threats! Phew, got that little rant out of the way! Hope you are seeing some spring weather.